When I go to the file menu and choose “open recent” I get an error message saying “loading failed.” It doesn’t matter whether I try this on starting up, or try to access another recent file while I’m working on another. This error message happens even if I just closed the file a minute ago and want to reopen it. The files will open just fine if I use the regular old “open file” protocol, so it’s not that the files are damaged or anything. I store the files on my hard drive, and haven’t moved them anywhere between using them the first time and trying to reopen with “open recent”. This isn’t a major problem, but it would be nice to have this facility actually working. Thanks for reporting and sorry for the inconvenience. I suppose you are using the desktop version, right? You never saved the files to the Cloud, only locally? Does it work if you save a file to the Cloud? Could you please try to install the latest version (3.2.6) from https://designer.io/#download and see if it solves the issue? Could you please try if it works in the web app at https://designer.gravit.io? Yes, I am using the desktop version. Upgrading to the latest version did not solve the problem. Trying to access a recent file from the Cloud using “open recent” does not solve the problem. Alright, thanks for your help, I’ll file a bug. You mean, you can’t save a file in the desktop app and open it in the web app or vice versa? There must be something corrupt in your version or system configuration. Could you please send a file, that doesn’t open from “Open recent” to hello@gravit.io and another one, that you created in the web app and that doesn’t open in the app? This would help greatly to solve the issue. Thanks for reporting. Could you please share such a file, that can’t be opened anymore, with us at hello@gravit.io? Please mention this forum thread for reference. The problem seems when opening (and closing) gravit, if as a first operation we choose “open recent” from the main screen or from the top menu: file -> open recent … and so the error (bug / problem) comes out " Loading has failed "failed "
Could you please answer some these questions? Does the loading fail both from the start screen and when choosing “File > Open recent” in the menu bar? Does it happen both for local and Cloud files? Does it happen on both of your Mac devices, meaning in El Capitan and High Sierra? Can you please share a file, that can’t be opened from “Open recent” at hello@gravit.io? Please mention this forum thread for reference. I got similar problem too. So, I avoid opening files from the Recent command. Are you on macOS, too? Yes, I’m on MacOS El Capitan 10.11.6 with Gravit 3.3.1. The problem happens since the first time I installed Gravit, I don’t remember the version. Do you use a cloud service like OneDrive, where the files on your hard-drive are synced to? 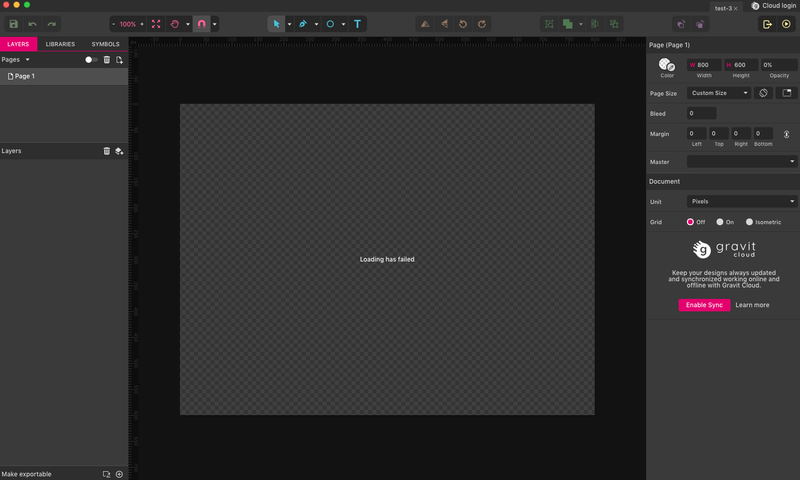 Does it work to open the file in the web app at https://designer.gravit.io? Can you please send the file, that doesn’t open, to hello@gravit.io? Please mention this forum thread for reference. In this email, please also send a screenshot of the console output along. To open the console in Gravit Designer, press Shift + Ctrl + F12, this opens a new area in the window, probably at the right or bottom. Then press Esc, which opens another area, the actual console. Now try to load the file again and create a screenshot of the output of this console. Unfortunately, we currently have problems with opening files from OneDrive and similar cloud services. As a workaround, could you please copy the file to your local hard-drive, without syncing them to OneDrive (or similar), or please use the web app instead.